Posted January 18, 2008 in 2008/01, 5 Studio, Artists, Featured Work, Harvey, Meskin, Mort, Periods, Topic, z Archive. By 1954 Mort Meskin had been providing work for the Simon and Kirby studio for four years. Even more important then the amount of time spent was the volume of work; Mort executed more work for S&K then any other studio artist. 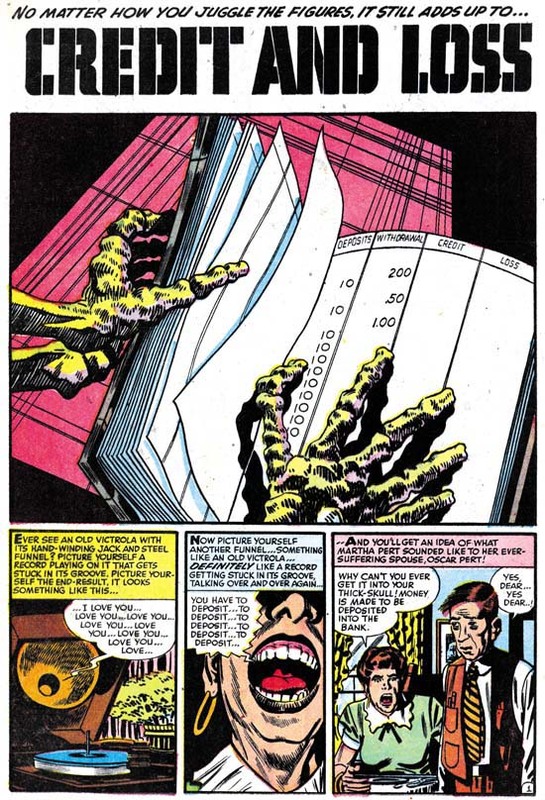 There were even periods that Mort’s page production rates exceeded Kirby’s who was justly famous for his productivity. Mort’s contribution went beyond volume; he played an important part in the S&K classic Boys’ Ranch (1951). It was Mort who persuaded S&K to create that unusual title Strange World of Your Dreams (1952) for which he listed as an Associate Editor. 1954 was an important year for both Meskin and S&K as well. 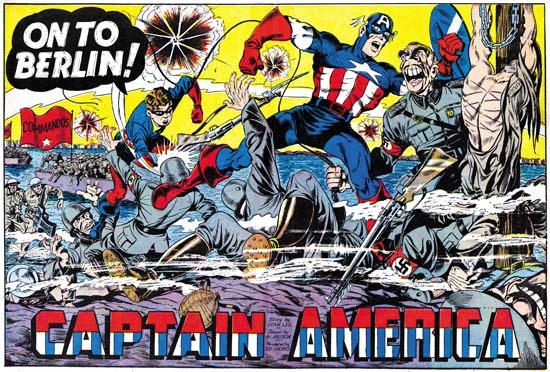 In that year Simon and Kirby would return to the superhero genre with Fighting American published by Prize. Even more important Joe and Jack would create their own comic publishing company called Mainline. Considering Meskin’s contributions in the past, it would be expected that he would play a significant role in these projects, but he did not. 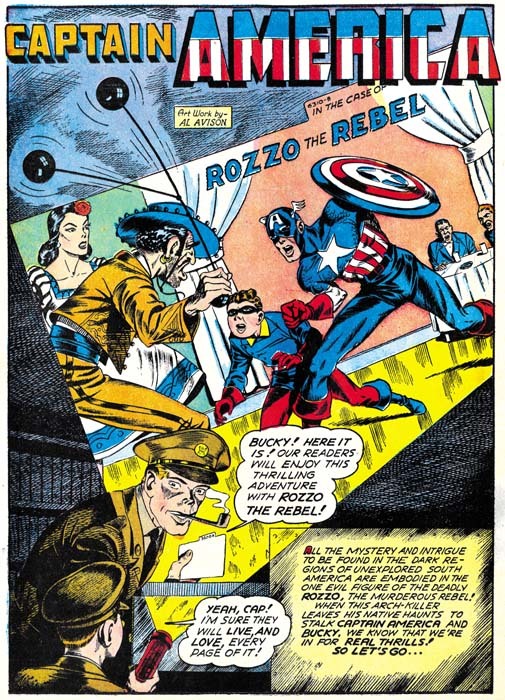 Mort provided no help with Fighting American and only shows up in a few initial issues of the Mainline titles. 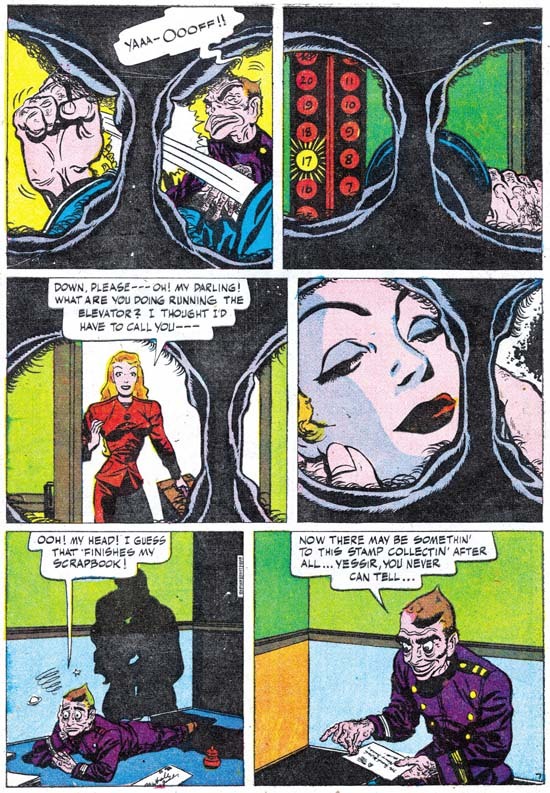 Since Mort was creating art for the Prize romances (still being produced by Simon and Kirby) his absence from the other projects is hard to explain. 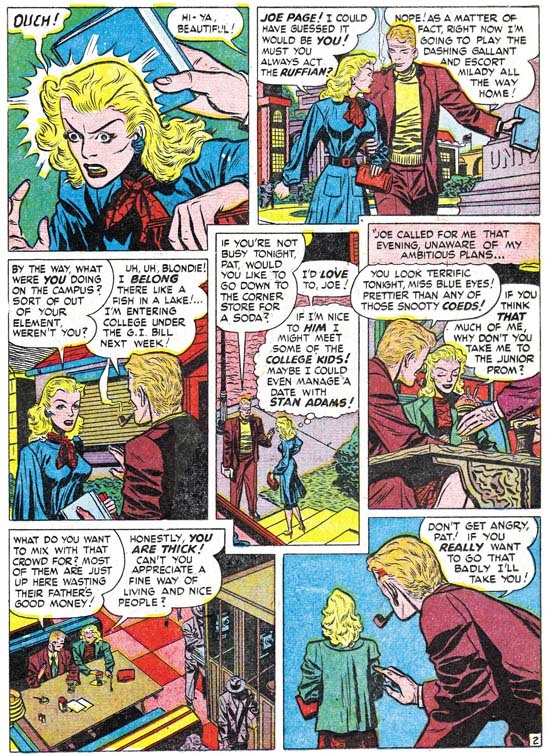 1954 was of note for Mort because it marked his return to providing art for DC. This was not an exclusive arrangement, as mentioned above Mort would continue to provide work for the Prize romances. Meskin also did one work for Harvey’s Chamber of Chills. The hero of this story is the meek and troubled Oscar Pert. He could have been happy, if only he was not oppressed by his wife, Martha. The only important thing in life for Martha was the continual depositing of money into the bank. Everything else must be sacrificed. Oscar lost his friends when he was no longer able to pay club dues. Martha would not even let him spend a little money for milk to give a stray cat. But finally Oscar devises a new means to happiness. We see him in his cellar stealing moments away from Martha, designing some project. His increased sense of contentment is noticed by all but understood by none. That is until Martha discovers his drafting ruler and pawns it off. Apparently that is the last straw because that night Martha hears a strange ticking noise coming from the cellar. She finds a box down there and when she investigates the box’s opening the trap is set. 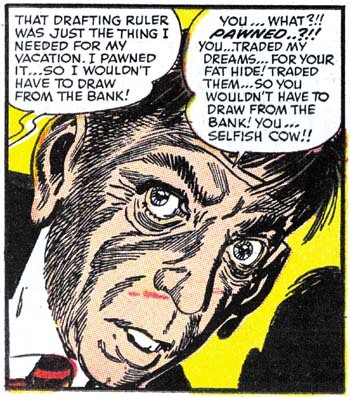 The story ends with Oscar making his own rather gruesome deposit to the bank vault. The story was not written by Mort, but he makes the most of it. He is at the top of his form in story telling, and that means a lot because Meskin was a consummate graphic story teller. His shifts in distance and perspective are done not just to provide variation, but as a means to advance the story itself. 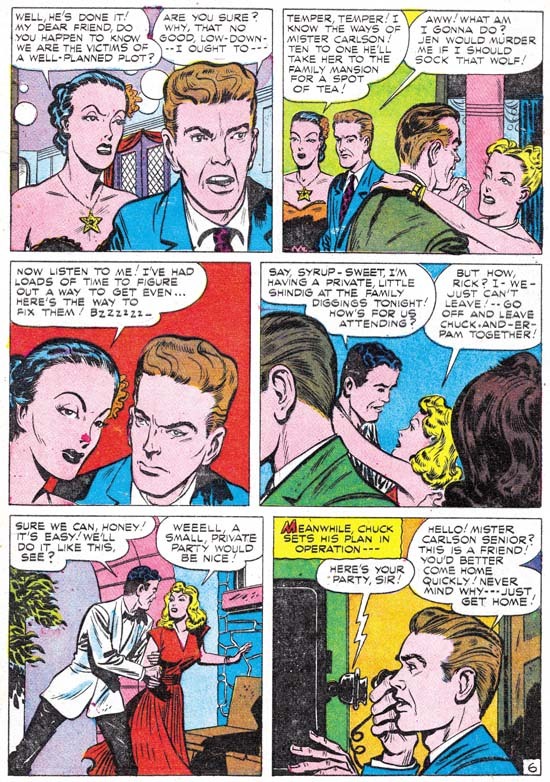 Take the sequence that starts the tale; a panel of a broken record introduces the theme of repetition, the next panel has advances the theme with a close-up of a woman’s nagging mouth, with the final panel a more distant shot providing an introduction to the main characters of the story and their relationship. Mort’s art is excellent, particularly the inking. The splash panels uses the S&K studio style with bold picket fence brush work (for an explanation of this term, see the Inking Glossary). The image of the skeletal hands with ledger is not a literal summation of the story but it does effectively symbolize the theme. I cannot explain what the ruled background represents, perhaps another visual reference to a financial ledger? In any case it is a pleasing pattern as if designed by Mondrian. After the splash Meskin drops using the S&K studio style and adopts his more typical inking methods. 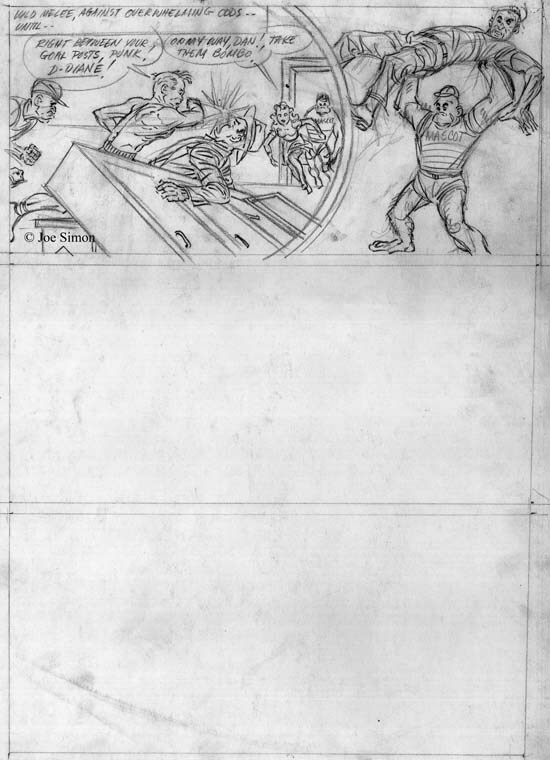 However that is a little misleading as Mort’s inking is here much more elaborate then what he had previously been using in work that he had done for Simon and Kirby. For example Meskin typically constructed eyebrows as a couple of overlapping simple brush strokes, but for close-ups in “Credit and Loss” the eyebrows are made with numerous brushstrokes that suggest the individual hairs. Instead of simple brushing for shadows on faces, here Mort provides some careful crosshatching. Meskin even seems to take much more effort with the drawing as well. The close-ups of Oscar are some of the best portrayals that Mort has ever done. The large soulful eyes and small chin suggest his submissive character. But note how in the panel I provide above how Mort subtlety reveals Oscar’s awakened spirit of resistance. With such a great piece of art it is a wonder that Mort Meskin did not do more work for Chamber of Chills. I really do not have the timing of Meskin’s non-S&K work down very well, but perhaps it is nothing more then having been returned to the better paying DC Mort felt no need to pursue work from Harvey. Joe Simon’s collection includes the complete original art for “Credit and Loss”, as well as some other art from the same Chamber of Chills issue. So maybe even at this early date Joe was giving Harvey a hand. If so, Simon was not passing onto Harvey excess S&K material, this story much more deserves being called horror then anything found in S&K’s own Black Magic. The tale goes beyond what Joe and Jack would have considered to be in good taste. Whatever the explanation for its unique status, “Credit and Loss” is a masterpiece. Unfortunately its presence in a rare comic means it has not been seen by many. Maybe someday it will get the reprint treatment it so richly deserves. Posted January 5, 2008 in 2008/01, 5 Studio, Art of Romance, Periods, Prize, Serial Posts, z Archive. I am sure when most fans think about Simon and Kirby they have in mind titles like Captain America, Boy Commandos, Stuntman, Boys’ Ranch, Fighting American, and so on. Super heroes, kid gangs, and lots of action. No doubt about it, those were great comics. Fans, particularly the more die hard ones, also appreciate S&K take on crime (Headline, Justice Traps the Guilty, and Police Trap) and horror (Black Magic and Strange World of Your Dreams). But when fans bring up Simon & Kirby I suspect they rarely talk about the romance titles (Young Romance, Young Love, Young Brides and In Love). However to understand Joe, Jack and what they did, the romance titles really are a good place to go for two reasons. The first is that it was a whole new genre. 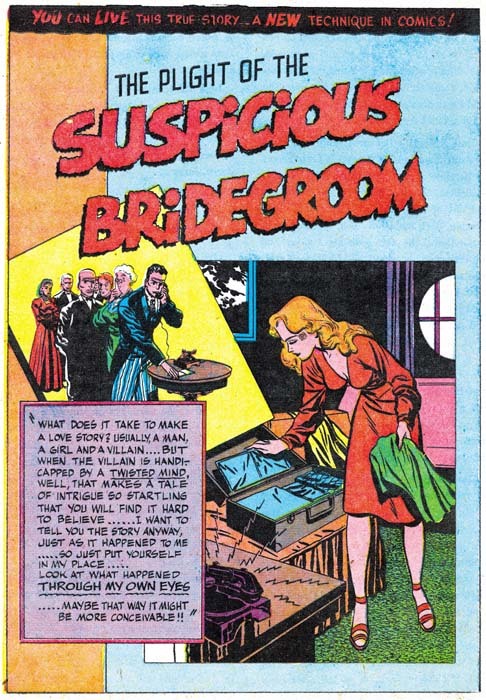 Despite what some would have you believe, there were no prior romance comics to serve as prototypes. Joe and Jack had to figure it all out themselves. The second reason concerns how much romance work S&K did. 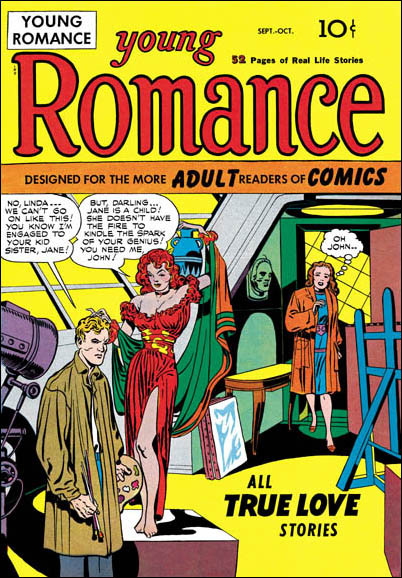 For the period starting on September 1947 (the first issue of Young Romance) and ending with October 1956 (in November Battleground #14 came out and Jack had begun freelancing) Kirby drew 1679 romance pages (covers and stories) compared to 1652 pages for all other genre combined. During this period super heroes and kid gangs came and went but romance was pretty much a constant. 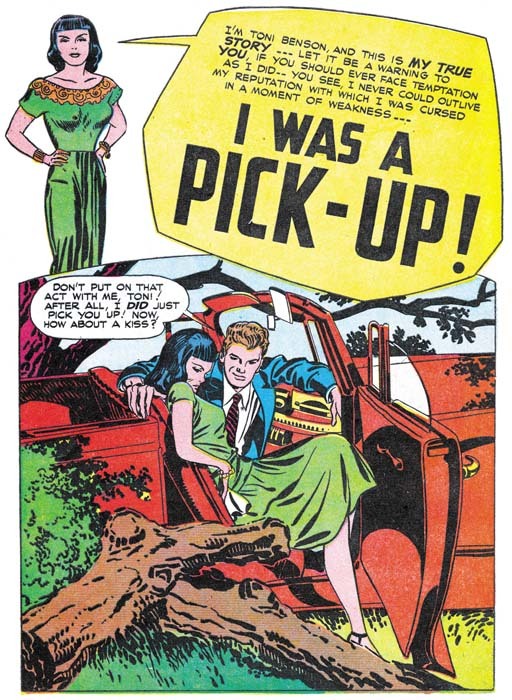 Romance pulps could have served as prototypes for romance comic plots. 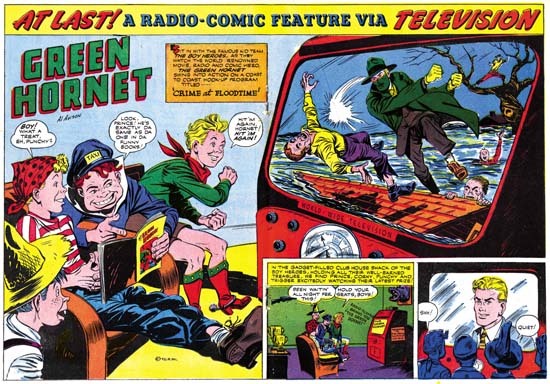 But comics are also a visual media and pulps could not help with that aspect. 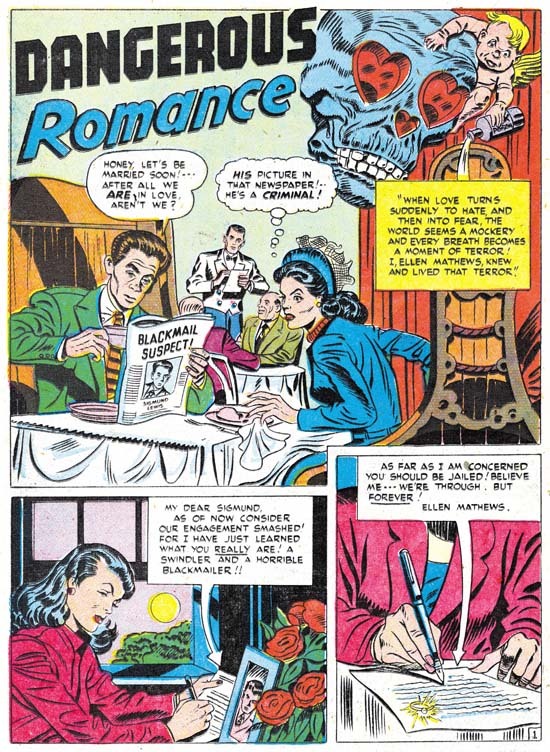 To make matters worse by the time Simon and Kirby began working on romances they had already abandoned devices they had previously used to make their pages more exciting. 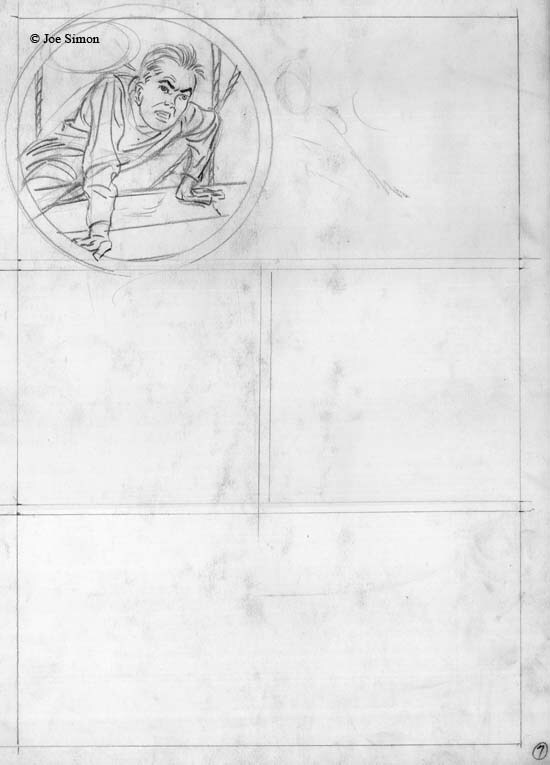 Largely gone were the variously shaped panels and in their place would be a pretty standard comic grid. Also the extension of figures outside of a panel into other panels was no longer done. 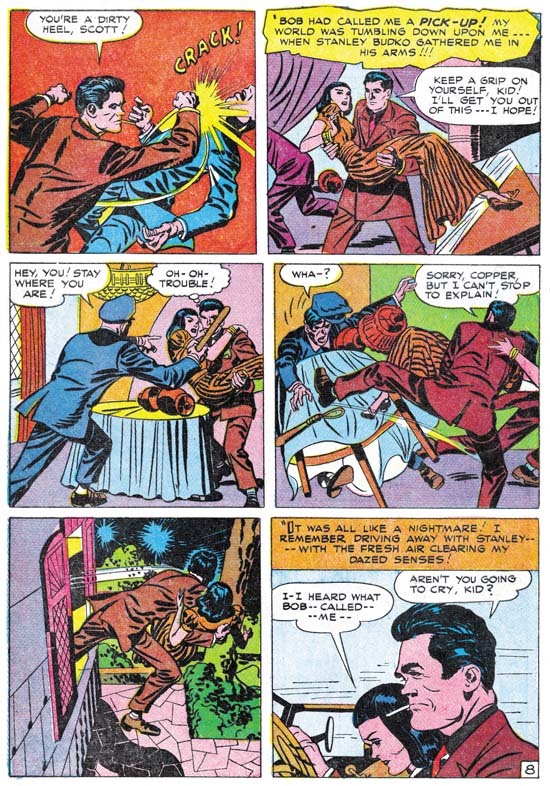 But Kirby had shown in his crime work that he did not have to use those graphic devices to make exciting comics. However crimes stories could have a lot of action and violence, stuff that Jack excelled at. What could be done with a subject like romance? Well one thing Kirby did was keep the action. Well of course there could be no super heroes or kid gangs in a romance story but Jack would often include a fight. If Jack wanted variation from always having a fight he would add a sport scene or something similar to inject some action. In the first four issues of Young Romance Jack did 10 stories which have 4 fights, 3 slaps, 2 rescues, 1 swimming race and 1 suicide. 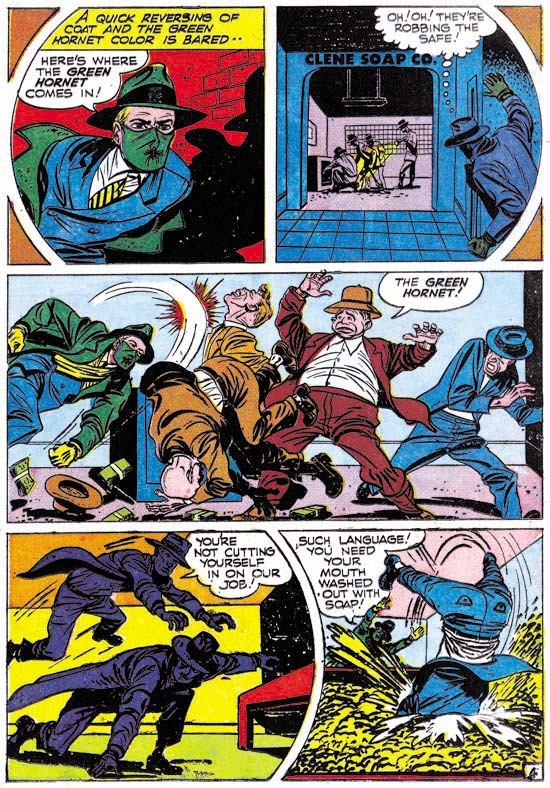 The use of action is not limited to the Kirby drawn stories, in the 8 non-Kirby stories we find another fight, a fire, a ransom, a blackmail bust, and a robbery trial. Do not get the wrong idea, the stories in the early issues of YR fit the romance genre just fine. The fights and action scenes play a very small part of the plot. Like any proper romance, the story resolves around the love angle. Despite the “for the more adult readers of comics” claim of the cover, the target audience was clearly teenage girls. I cannot help wondering what those romance readers thought about the fights. Perhaps it did not bother them much since as a new genre they had not yet developed their own expectations. 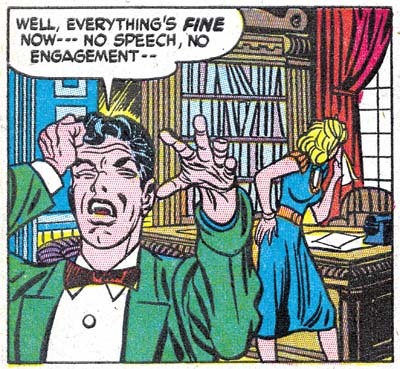 Regardless of whether the original readers liked the action that Kirby brought to romance, for the modern truly adult reader, Jack’s stories have special interest. Fights and sports were not the only unexpected touches that Kirby used in his romances. Jack often showed the first meeting of a couple (at least for the story) with a rather physical greeting from the man towards the woman. This sort of roughhousing seems more appropriate for younger individuals than those portrayed. But perhaps Kirby was showing his savvy about the experience of the readers who were younger then the couples of the stories. 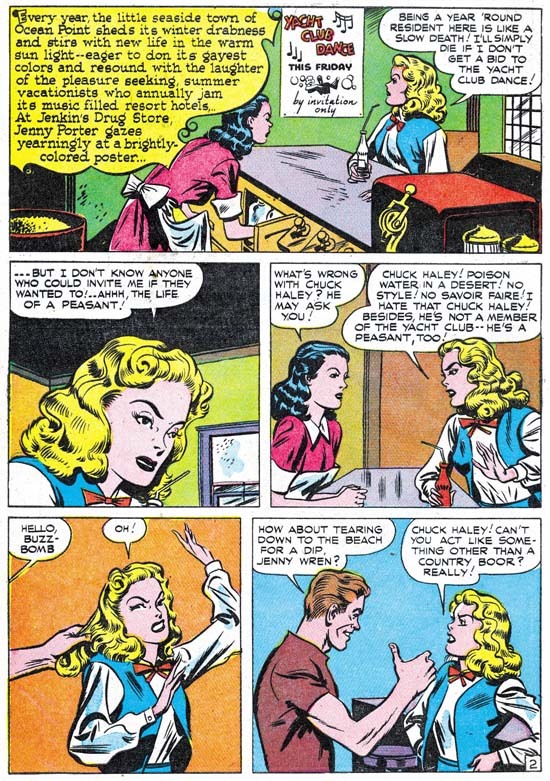 As I mentioned above, the use of action was not restricted to the Kirby stories in the early issues of Young Romance. 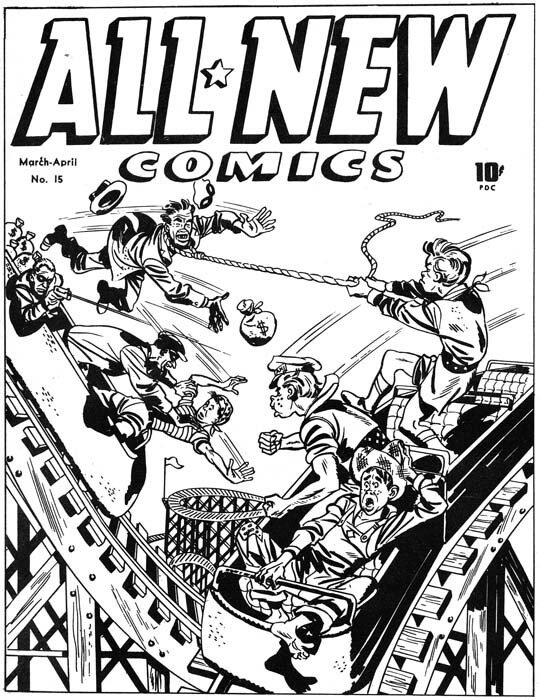 In later issues action would remain a part in the Kirby drawn stories but would play less of a part in those done by other artists. 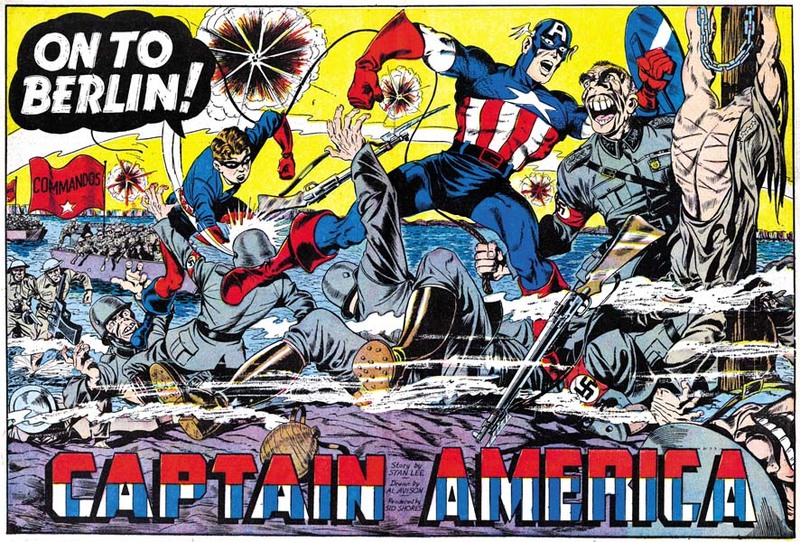 I interpret this emphasis on action as an indication of Kirby’s involvement in the plotting of his own scripts. Further that in the earlier issues Jack also helped plot the stories for some of the other artists as well. Another indication of Kirby plotting for artists can be found in a page done by Bill Draut. The first panel of the page shown above has the same type of physical greeting that appears in some of the Kirby pages as well. 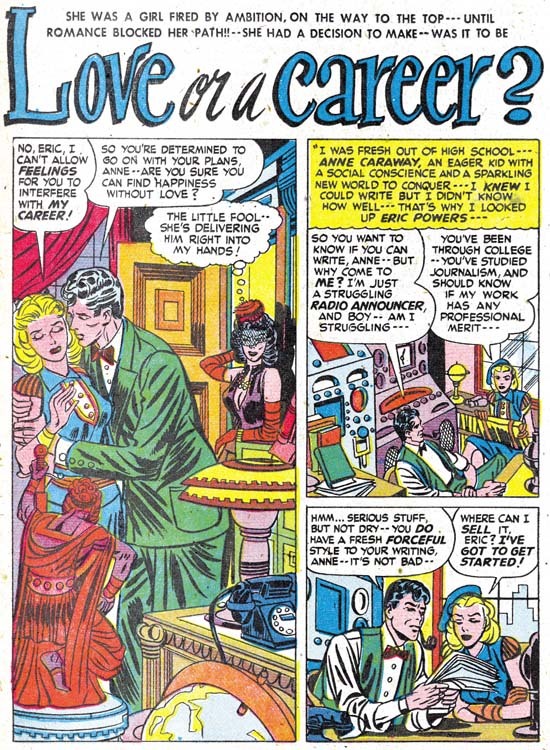 This is the beginning of a serial post Simon and Kirby romance comics. As mentioned above, Joe and Jack’s involvement in romance titles was long and fruitful. It will take a lot of posts to cover this topic adequately. I do not want to turn this blog into one on just the romance genre, so this serial post will not be as continuous as some previous ones. Instead chapters will appear from time to time, interspersed among posts on other S&K subjects. However I have not finished writing about the first few issues of Young Romance, so next week I will return with a chapter about the initial artists.